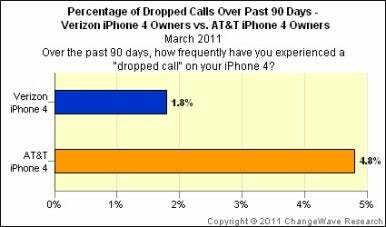 Now that the Verizon iPhone 4 has been in the wild for almost two months, how does it stack up to its AT&T counterpart? According to the latest survey out of market research firm ChangeWave Research, pretty favorably—and in some ways, it even tops its rival. ChangeWave’s latest survey talked to 4,068 consumers and polled them on a variety of factors, including overall satisfaction. 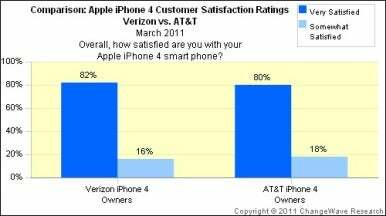 In that realm, the Verizon and AT&T iPhones ran neck and neck: 80 percent of AT&T iPhone 4 owners said they were very satisfied, with 18 percent reporting they were somewhat satisfied, compared to a very satisfied 82 percent of Verizon iPhone owners and somewhat satisfied 16 percent. But if there’s one particular area of interest for those deciding between Verizon and AT&T, it’s how well the phone part of the iPhone 4 works. As such, ChangeWave surveyed users about how frequently they ran into dropped calls in the last 90 days. And the numbers there showed a significant gap: while Verizon iPhone owners experienced droppage on about 1.8 percent of calls, AT&T iPhone owners saw calls dropped at a rate of 4.8 percent—more than twice as much. To support that conclusion, Carton points to the data that ChangeWave has collected in its regular surveys of wireless service providers, in which it tracks call drop data for all four of the U.S.’s major carriers. “The best other piece of data we have is the relationship between this current survey and the historical record for Verizon versus AT&T,” says Carton. In this most recent survey, ChangeWave found that Verizon had the lowest rate of call droppage over the past 90 days, 1.4 percent. That was followed by T-Mobile at 2.3 percent, Sprint/Nextel at 2.7 percent, and AT&T at 4.6 percent. Those numbers gibe with the data ChangeWave has collected over the past few years: Between September 2008 and March 2011, Verizon’s dropped call rate has vacillated between a high of 2.7 percent and a low of 1.4 percent, compared to AT&T’s high of 6 percent and low of 3.3 percent. When asked whether the Verizon iPhone’s relatively short time in the wild has contributed to the lower dropped call rating, Carton calls it a potential variable, pointing out that we could see more network problems as the number of iPhone owners on Verizon ramps up.